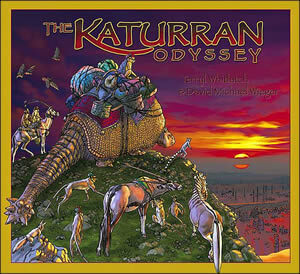 The Katurran Odyssey is a remarkable visual achievement, filled with spectacle, fantasy, and wonder on every page. This epic tale of faith, hope, and selfless heroism is illuminated by the stunning illustrations of Terryl Whitlatch, the principal creature designer for the Star Wars prequels, and is brought to dynamic life by the storytelling of screenwriter and author David Michael Wieger. Bo-hibba is a remote island in a faraway time and place that is populated by animals who are at once fantastic and startlingly real. The island's survival is threatened by the Long Winter, and not even the High Priest's ancient ceremony of renewal can put an end to the suffering from the hunger and the cold. Katook, a small but courageous young lemur, lives in the village of Kattakuk. When he dares to enter a forbidden area on the island and witnesses a shocking act, the outraged priests banish him from the island forever. Forced to journey across the vast sea in search of a new home, Katook encounters great perils and marvels on his quest and undergoes profound tests of trust and friendship. At last, he finds the place where the secret of the Long Winter is revealed and where he must confront his greatest fear if he is to save his family and his island home. Like such classic works of fantasy as Tolkien's Lord of the Rings, Rien Poortvliet's Gnomes, C. S. Lewis's Chronicles of Narnia, Brian Jacques's Redwall series, and Brian Froud's Faeries, The Katurran Odyssey creates a mythic world imbued with beauty, adventure, and transcendent imagination. Terryl Whitlatch spent eight years working for Lucasfilm LTD., Industrial Light and Magic, and George Lucas' JAK Films and is considered the foremost creature designer in the world. She is an internationally recognized animal anatomist, having served The World Wildlife Fund as Senior Consultant for Wildlife Art and Animal Anatomy. Her unique combination of illustration skills and comprehensive knowledge of animal anatomy and movement are essential components in the design, anatomy, and physical animation aspects of creature creation. In her work on the new Star Wars trilogy, she worked directly with George Lucas for whom she designed countless creatures for the films and related products, including CD-ROM. A collection of her work for Lucasfilm, "The Wildlife of Star Wars," was published by Chronicle Books in 2001 to critical acclaim and popular success. Terryl also designed for many electronic and interactive games including Steven Spielberg's The Dig. Terryl has worked with many major studios and effects houses as a creature and concept designer. Her films include Jumanji I and II, The Indian in the Cupboard, Bear Country, Dragonheart and Polar Express. In addition to her continuing work on the Katurran Odyssey series, Terryl is designing fantasy animals for a traditional carousel to be built in her community. Terryl makes her home with her husband, Tom, in Oregon. David Michael Wieger's career as a writer spans a wide range of media. His prose, poetry and short fiction have appeared in numerous literary journals in the United States and he has taught creative writing classes and workshops in California. His plays have been produced to critical acclaim in Chicago, Los Angeles, Amherst and Santa Barbara, California. As a screenwriter, David received a prestigious Sundance scholarship, where he worked closely with some of the top screenwriters and directors in the field. David's ability to create compelling and unique characters has attracted creative collaborations with several leading actors, including Malcolm McDowell and Dustin Hoffman. David has produced screenplays for many of the major studios including his film "Wild America" (Warner Brothers). David lives with his wife, Saral, their dog, Enzo, and their two cats, Floyd and Earl, in Santa Barbara, California.